Wartime star for the Blues from WA. Like his fellow West Australian Ern Henfry, George Bailey had a relatively brief yet significant career with the Old Dark Navy Blues amid the turmoil and uncertainty of World War II. After two impressive seasons first-up with Carlton, he went back to Perth while training with the RAAF, and won the 1945 Sandover Medal with the Redlegs. At war’s end he stood out of football for 12 months to win a clearance back to Carlton, and repaid the Blues’ faith in him by helping fuel the drive to the 1947 Premiership. Had he not been prevented from playing VFL football for four complete seasons by war service, George Bailey probably would now – like Henfry - be regarded as one of the great Blues of his era. At the outbreak of war in 1939, Carlton’s WA scouts had already been impressed by Bailey’s efforts as a follower-defender for Perth, so when he enlisted in the RAAF and was posted to Melbourne for flight training, the Blues arranged for him to play at Princes Park on match permits. He made his senior debut wearing guernsey number 5 against Richmond at the Punt Road Oval in the second round of matches in 1941. Carlton lost by 10 points, in a match remembered more for the serious injury suffered by 1938 Premiership star Jack Hale - a broken leg that ended his career. Carlton claimed the minor premiership that year, only to disappoint by losing successive finals to Melbourne and Essendon. One of the few consolations for Blues’ supporters however, was Bailey’s form on the last line. Safe and dependable, he was a natural defender whose strong hands, coolness under pressure and long kicking complemented an already promising back half. Unfortunately, that potential was never able to blossom at Carlton, because late the following year – with Australia under real threat of a Japanese invasion – Bailey was posted back to his home state for the next stage of his training. His war service meant that he played very little football at all throughout 1943 and ’44, but in 1945 he turned out again for Perth and was simply sensational. The wartime WAFL gave little away to the VFL in terms of the quality of its competition, yet Bailey’s outstanding comeback season won him the Sandover Medal, as well as Perth’s Best and Fairest award. Little wonder then, that the Redlegs fought tooth and nail to keep him when he applied for a clearance to rejoin Carlton as Australia came to terms with peace at last in 1946. Perth stood firm, but George was committed to Carlton and stood out of the game for another season to eventually win his release. He arrived back at Princes Park to an atmosphere of relief and confidence. Strengthened by the return from service of many star players, and inspired by the leadership of their brilliant first-year captain Ern Henfry, the Blueboys finished on top of the home and away ladder, and went on to claim Carlton’s eighth VFL Premiership with a desperate, last-gasp win over Essendon in the Grand Final. 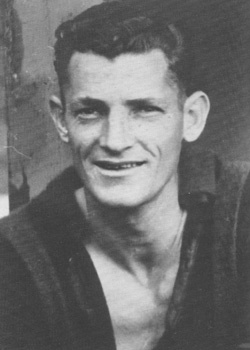 In one of the most celebrated moments in our history, small forward Fred Stafford snapped a left-foot goal in the last minute of the match to get the Blues home by just one point. Understandably, the Blues celebrated long and hard after that epic victory, and eventually paid the price by missing the finals completely in 1948. Bailey had packed a lot of excitement into the previous decade by then, and longing for home made up his mind to head back west. He finished his remarkable career at Carlton as he had started it – playing in a narrow defeat by Richmond at Punt Road in round 8, 1948. He wasn’t quite ready to give football away completely however, and in 1949 let bygones be bygones to don the black and red colours of the Perth Football Club once more. Over the next four years as a player and coach with the Redlegs, George was part of two losing Grand Final sides. He eventually stepped down in favour of his former captain at Carlton, Henfry, who took the Redlegs to a long-overdue flag at last in 1955. A valued and respected life member at both Perth and Carlton, George Bailey remained active in West Australian football for many years after his retirement from the field, and in 1999 was honoured with selection in the back pocket of Perth’s Team of the Century. George had played 52 games with Perth prior to joining Carlton. Contributors to this page: Jarusa , PatsFitztrick , blueycarlton , Bombasheldon , molsey , tmd1 , true_blue24 , Juzz and admin . Page last modified on Tuesday 16 of May, 2017 22:56:29 AEST by Jarusa. 1985 Elim. Final - Player Profiles (pg 1 of 2).